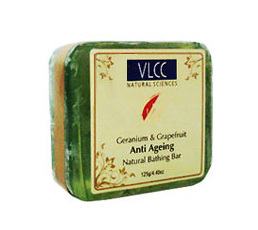 Buy VLCC Anti Ageing Natural Bathing Bar. Made from Geranium and Grapefruit. Natural skin cleanser. Online Shopping VLCC Natural Sciences products from India. The premium bathing bar with Anti ageing properties gently cleanses the skin. Enriched with Honey, Vitamin E and Geranium Oil, it effectively tightens the skin without leaving it dry. Reduces lines and wrinkless, leaving skin soft and younger looking.